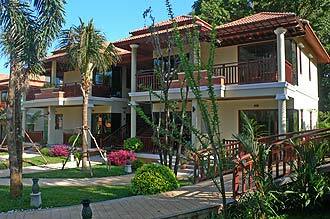 Khaolak Bayfront Resort is situated in the province of Phang Nga ; right on Andaman Sea in the south of Thailand . Offering tranquility, a beautiful beach, great amenities and a perfect view of the Andaman Sea , Khaolak Bayfront Resort is the right place for you to experience the heaven on the earth. Located in a secluded area with a golden beach frontage around scenic mountain backdrop, the resort is just one hour away from Phuket International Airport . 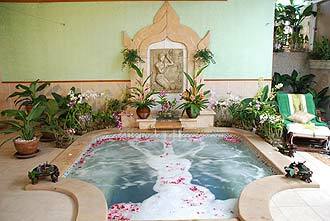 Jacuzzi for stimulating the body activity, Sauna for the blood stimulating, Thai Herbal Steam for your feeling freshen and blood circulation, Thai Traditional Massage the pressure therapy natural healing method. Foot Reflexology Massage fervent and cures some disease from organs nerves. Oil Massage (aromatherapy) for combination massage techniques Thai and Swedish with our unique style with aromatic oil and for your choice. To Leave feeling balance and relaxation. Out door on the front beach which deep 60 C.M. for children and 90-150 C.M. for adult. 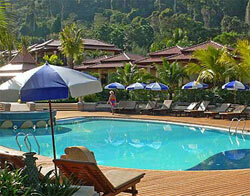 There are sundeck chairs around the pool and on the front beach. Just 20 minutes away from the resort, which features 15 holes, know as an international golf course. Khaolak Bayfront is the closest resort to the departure point for Scuba diving and snorking at "Similand Island" renowned as one of the world's finest reef diving locations with five star diving center "KON-TIKI"
Sight seeing & canoeing at James Bond Island, Sea Gypsy Village. Jungle walking, whitewater Rafting and Elephant trekking through the beautiful jungle. The resort is the closest to the National Park (10 minutes by walk) is suitable for exploring the tropical rain forest and enjoy swimming in the weterfall's pond. 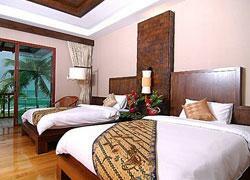 The resort provides you with 4 beachfront bungalows, 8 sea view bungalows, 48 deluxe rooms and 14 standard hillside rooms. The beachfront bungalows have created a comfortable and tranquil environment for you to relax and enjoy its gorgeous location. 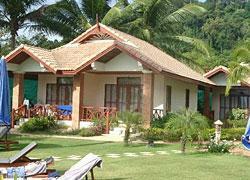 Each bungalow covers an area of 45.20 sq. meters. 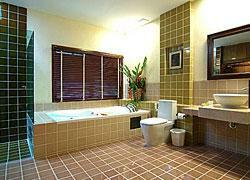 With Jacuzzi, bath tub and separate shower, private balcony. 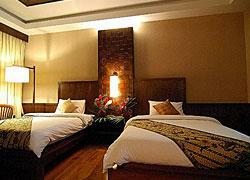 Each room has ability to accommodate up to 2 adults and 2 children. 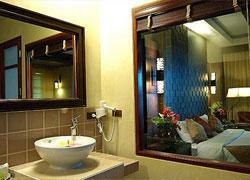 Other facilities include mini bar, safe box, satellite television, IDD telephone, tea and coffee maker and hair dryer. Great sea view and swimming pool. 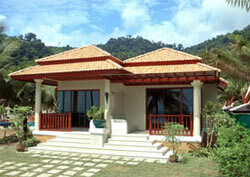 The sea view bungalow covers an area of 45.20 sq. meters. Each sea view bungalow features a large bed, shower, private balcony, a mini bar, safe box, satellite television, IDD telephone, tea and coffee maker and hair dryer. View swimming pool and, mountain. 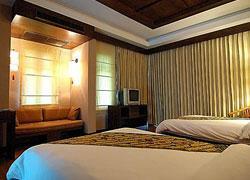 Deluxe room covers an area of 38.20 sq. meters. Each deluxe room has a large bed, shower, private, balcony, a mini bar, safe box, satellite television, IDD telephone, tea and coffee maker and hair dryer. 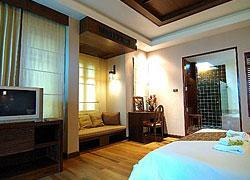 Each room covers an area of 34.00 sq. meters is equipped with shower, private balcony, a mini bar, safe box, satellite television, IDD telephone, tea and coffee maker and hair dryer.